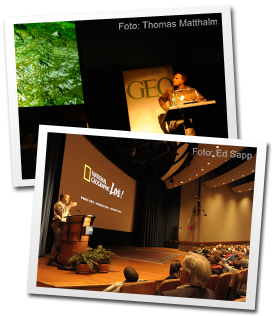 does global speaking engagements about his expeditions and wild experiences. He travelled into extreme and otherworldly environments worldwide. His inventory of images is continually surprising and so spectacular, that his photographs are published in the most influencial magazines such as National Geographic. He won prestigeous awards like World Press Award or the EMMY award for his filming. Get an interesting insight to his work and even more surprising views to our world. 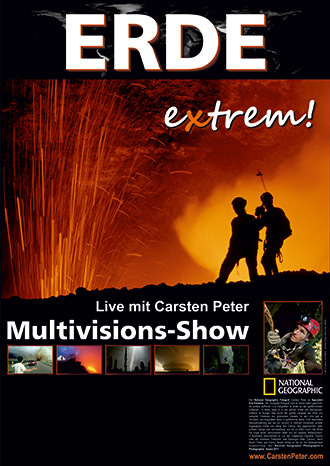 Carsten Peter lectures not only in German speaking countries, but also worldwide in English and for comercial purposes. He speaks for National Geographic live and can be seen in England, Scandinavia, US, Canada and as a speaker for National Geographic Expeditions even in the remote parts of this world. the biggest cave galeries of this world. as well as renowned alpinist and North Face athlete Conrad Anker. The Mary Alice and Mark Shepherd Jr. Atrium, Caruth Hall. Congo and share images from his exploration of the worlds largest cave passage in Vietnam, Hang Son Doong. 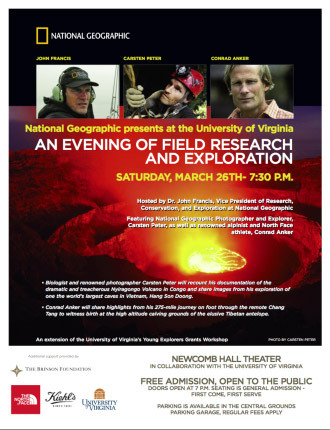 7:30pm, Washington DC, National Geographic, Grosvenor Auditorium. Expedition to the deepest point of Germany. Geo-photographer Carsten Peter explored with a team of Arge Bad Cannstatt the longest and deepest cave in Untersberg mountain and brought back amazing images and stories from this very remote location. Discover Germany in a new way - never seen like this.